The Memorial Candle Program has been designed to help offset the costs associated with the hosting this Tribute Website in perpetuity. Through the lighting of a memorial candle, your thoughtful gesture will be recorded in the Book of Memories and the proceeds will go directly towards helping ensure that the family and friends of Daniel O'Brien can continue to memorialize, re-visit, interact with each other and enhance this tribute for future generations. Daniel Bart O’Brien of Kirkwood, Missouri, died unexpectedly in his sleep on Monday, April 1st, 2019. Daniel, age 28, was the beloved son of Kevin and Amy O’Brien, dear brother of Kelsey O’Brien (Shaun Moore), Courtney Decher (Jason), Patrick O’Brien (Katie), and Molly Williams (Michael). Dan was a fun uncle to Jaxon & Addie Decher, Allison O’Brien, and Bear & Wilder Williams. He was also the beloved son of Carmen Perez Coranine and dear brother of Cesar Perez Coranine. Daniel was born in Lima, Peru on October 12, 1990, and lovingly adopted 5 months later. He grew up in Webster Groves and Kirkwood, Missouri surrounded by his family and friends. Growing up the youngest of five children, Daniel was doted on by his older siblings who all fought to sit next to his highchair and feed him when he was a baby. To avoid squabbling, Mom devised a rotating seating chart so each sibling got their turn. Daniel hated to miss any of the family activity so he could most often be found in the living room hugging one of the many canines that circled through the busy O’Brien household. A lifelong dog lover, Daniel cherished his boxer Zeus and all of the prior O’Brien canine pets. After graduating from Kirkwood High, Daniel followed in the footsteps of his parents, brother, and many relatives by enrolling in the University of Missouri-Columbia where he was a proud Tigers fan. Daniel and his close friend and cousin, Jake Richerson, lived together both at and after Mizzou sharing many good memories. His parents were very happy Daniel chose to move back to St. Louis after a few years away. They saw Daniel regularly when he wanted to raid the frig, do laundry, and catch up. 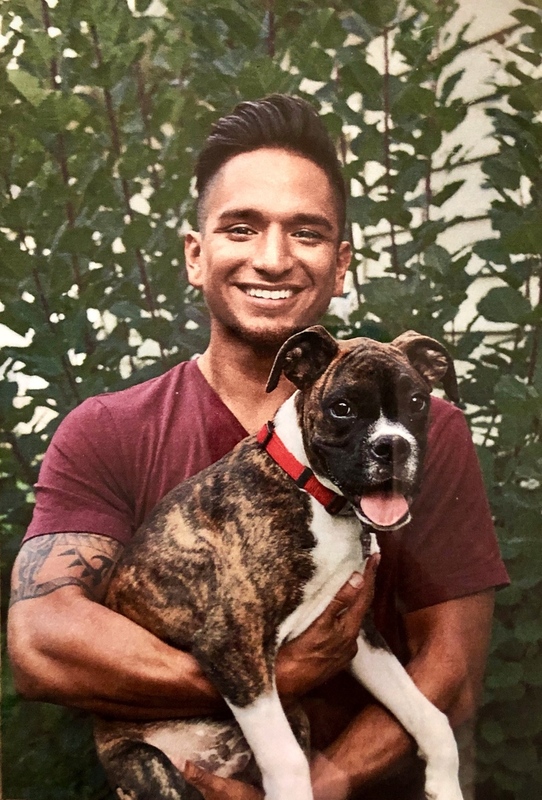 Daniel will be remembered fondly for his beautiful smile, his discipline working out and eating right, his affinity for Peruvian culture, and his great love of dogs, cars, tattoos, and other people. He will be dearly missed and forever in our hearts. The arrangements are as follows: Visitation on Thursday, April 4th, 2019, from 3-8pm at Bopp Chapel located at 10610 Manchester Road in Kirkwood, MO. Memorial Service to follow on Friday, April 5th. Visitation is from 10-11amwith service commencing at 11am at Greentree Community Church located at 100 Kirkwood Road in Kirkwood, MO. A balloon launch will immediately follow the service in the courtyard to lift Daniel’s spirit up and celebrate his life on earth.